Cigar Choice Guide is our complete guide to cigars from around the world, including Cuban, Dominican and Nicaraguan producers. We have endevoured to compile a list of the main manufacturers and the cigars that they produce making this your definitive guide to international cigars. We have a put together information about a wide range of cigar types from Coronas to Presedentes. This guide also helps to enable you to select the perfect cigar for any situation be it a Corona with a glass of champagne or Robusto for a regular smoke. 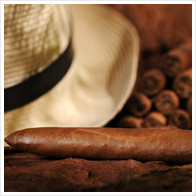 A cigar is bundle of tightly rolled and dried tobacco. The best cigars are often hand made and are matured for flavour. They come in a wide variety of styles, shapes and sizes. They have been smoked since the 10th Century. Europeans and the rest of the world did not benefit from the use of cigars until 1492 when Christopher Columbus came accross the indigenous people of San Salvador, in the Bahamas, smoking primative cigars. For more information please visit the cigar lounge for info of the first european cigar smoker. The cigar industy is one of the worlds largest legal industries. It is responsible for the employment of hundreds of thousands of people, often in countries where work is scarce and money is sparse. Due to the United States Trade Embargo against Cuba it is illegal for Cuban cigars to be sold or bought on United States soil, this has helped to attach a stigma to the Cuban Cigar industry. Read more about the history of cigars. There are many different types of cigar and every cigar is unique in flavour and strength so it is essential that you select the perfect cigar to suit your taste. 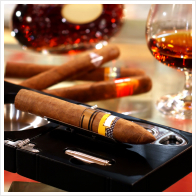 Choosing a cigar is akin to choosing a good wine and it does require a certain amount of knowldge. This knowledge can be gained through the UK Tobacco Cigar Smoking Guide.